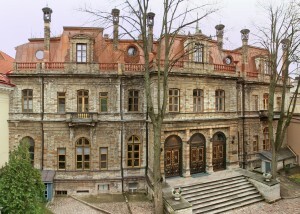 Founded in 1938, the Estonian Academy of Sciences (EAS) fosters frontier science, research excellence and competitiveness in Estonia while also representing Estonian science worldwide, e.g. in international organisations such as ICSU, UAI, ALLEA, EASAC, European Marine Board, CETAF, etc. It focuses on providing independent, highly professional scientific expertise and science-policy advice, communicating knowledge and raising public awareness of science and researchers. EAS supports research cooperation and mobility: operates a scientific exchange programme built on 32 bilateral agreements, serves as a EURAXESS Bridgehead Organisation and an academic partner for Lindau Nobel Laureate Meetings. It is organised into four divisions: astronomy and physics; informatics and engineering; biology, geology and chemistry; humanities and social sciences. Publications include the EAS Year Book, 8 peer-reviewed journals, article collections, etc. Electronic versions are available at www.akadeemia.ee.